First, I put in my guidelines the need to proceed from an adequate system of reality control. The adequacy is that currently there are many global destruction systems, and they can be external, such as from space. Therefore, the first element of each action is the system of salvation. This is, for example, a system of salvation from a possible global catastrophe, but the salvation from the possible global catastrophe is such that, first of all, it is necessary to make it happen at the inner harmony of a person, and the person at the same time should be aware that he is free and nothing threats him. That is to say, the development is such that you have harmony in each element completely with no depressed states in a joyous state of the Spirit. Since this is the system of real salvation and compulsory salvation, you act in the direction of universal creative development. Therefore, the guidelines of salvation from a possible global catastrophe, as well as the system of creative harmonious development, are the two systems that mutually intersect and often one comes from another; that is, as a rule, if there are some specific special technologies somewhere, you can see within the segments both the harmony and the element of instant salvation, or the system salvation. Therefore, the guidelines of my Teachings are such, that here, above all, it is necessary to consider the interaction of the required element at the right time. Hence, it is necessary to develop your spiritual state, your Spirit to the level for you to be indestructible and able always to save all. Therefore, you have to consider the guidelines always together, although they are separated from the point of view of systemic approach. In this system of salvation, I envisaged the possibility of real salvation based on one’s own Consciousness, when this salvation implies that you always follow the principle of salvation from a possible global catastrophe at the physical level and contribute to this development that principle that every element of your development will always include any action towards salvation. As “from a possible global catastrophe” includes also personal characteristics, you must therefore build the structure of development and the structure of salvation in order to spread them to often invisible from the outside or invisible timely systems that could be disastrous for you personally. In this connection, this system covers powerful layers of integration, integrated layers of information that connect you with the entire World. And you are in this world as an active participant. That is to say, it is the principle of your personal liberty. When you control any process, you are free. The Creator gives you the freedom to be infinitely developed. This is how the development is being arranged, that is when you have freedom you have infinite development. The urgency of the system of creative harmonious development is that you must first envisage the presence of the future in your development. And when you are looking at the future, the eternal development is an element of the future, as it is outlined by the Creator. The eternal Creator gives eternal development; that is the postulate. Therefore, you should be determined even in a specific moment of reality, that is, to offer the resistance, for example, to a possible global catastrophe or any particular disaster, and at the same time, feeling the harmony of any act of perception, i.e. joyfulness and confidence in the future, as well as consistency in the approach to your development. In this connection, the level of your development is first and foremost a recognition of the need to connect the harmony and the instant reaction to any system that can happen even in the future. Because the true level of salvation is to prevent the destruction and achieve full salvation due to the development of your own ideology, by increasing your development parameters, due to the fact that you will have eternal development in harmony. Therefore, the urgency is that you have creation as a development tool, and this tool urges you to a larger system of development. With this tool, you can also transfer the development to all the elements of the reality. The Teachings of Grigori Grabovoi about God. The Network Method of Control in Eternity. When you work with eternity objects, it is important to be able to lean against many elements. Then you will be able to choose the required access point and change it, or combine such points to form a more powerful control impulse. In this case, you should build dynamic supporting areas in front of the area where you plan to apply control. You should preliminary put the objective of control in each of these areas. Further, when you use this method, you should create in your consciousness silvery-white bars of light coming from your physical body to the supporting areas of control that you have built. Moving these areas mentally, you will be able to observe at the spiritual level, how the object of eternity yields to your control. As there are a lot of supporting areas in this technology and they have high speeds, the events that implement the objective of control may occur, but, at the same time, it may be unclear what supporting areas have formed the events. It seems a miracle. Altogether, there are many situations in eternity where favorable events develop as if miraculously. The objective of control in this case is to try to understand what actions have resulted in the implementation of the events. Since the technology of eternal life implies consistency in achieving goals, you should always understand what controls and supporting systems created the event. The Creator by producing an event in the future or in the past provides the current time. When you implement control in the form of networks, which consist of supporting areas of the information of eternity, you have to control your information from the moment of your birth, and then from the moment of conception. Then you will be able to observe that there is an infinite amount of information about you, and eternal life with this method is just constant perception of this information. The same refers to others. In eternal life technologies, make an effort to combine, in the same space of thinking, your exploratory highly intellectual premise with the spirit that is in a contemplating – controlling state. Thus, you will be able to overlay the diversified network control constructions, in which you have to perceive all the movements of the supporting areas, on a serene spiritual state that realizes eternal life. Grigori Grabovoi created the text of “The Teachings of Grigori Grabovoi about God. The Network Method of Control in Eternity.” on June 8, 2015. Учение Григория Грабового о Боге. При работе с объектами вечности важно иметь возможность опираться на многие элементы. Тогда Вы можете выбрать нужную точку доступа и менять её, или объединять такие точки для формирования более мощного импульса управления. В этом случае надо перед областью, к которой Вы планируете применить управление, построить динамичные опорные области. В каждую из этих областей требуется предварительно заложить цель управления. Дальше при использовании этого метода Вы создаёте в своём сознании серебристо-белого цвета отрезки света, идущие от Вашего физического тела к построенным Вами опорным областями управления. Мысленно перемещая эти области, Вы сможете на духовном уровне наблюдать, как объект вечности поддаётся Вашему управлению. Так как опорных областей управления в этой технологии много и они обладают высокими скоростями, то могут происходить события, реализующие цель управления, но при этом сразу не прослеживаются, из каких опорных областей сформировались события. Возникает впечатление чуда. Вообще говоря, в вечности много ситуаций, когда благоприятные события складываются как бы чудесным образом. Задачей управления в этих случаях является постараться разобраться, какие действия явились причиной реализации событий. Так как технология вечной жизни подразумевает системность в достижении целей, поэтому всегда нужно понимать, из каких управлений и опорных систем создано событие. Создатель, воспроизводя событие в будущем или в прошлом, обеспечивает текущее время. При формировании управления в виде сетей, состоящих из опорных областей информации вечности, нужно контролировать свою информацию от момента Вашего рождения и затем от мига зачатия. Вы сможете тогда наблюдать, что информации о Вас бесконечное количество, и вечная жизнь при данном методе лишь постоянное восприятие этой информации. То же самое и в отношении других. В технологиях вечной жизни старайтесь, чтобы Ваш исследовательский, высокоинтеллектуальный посыл совмещался в одном пространстве мышления с духом, находящимся в созерцающе-управляющем состоянии. Так Вы сможете многообразные сетевые конструкции управления, при которых нужно воспринимать все перемещения опорных областей, спроецировать на спокойное духовное состояние, реализующее вечную жизнь. Текст «Учение Григория Грабового о Боге. Сетевой метод управления в вечности» Григорий Грабовой создал 08 июня 2015 года. The Technology of Eternal Life. All should live eternally. Accordingly, everyone has to master the knowledge of how to live eternally. For this, we have to introduce the technology of eternal life everywhere. The eternal Creator forms the eternal. Any education should include knowledge that ensures eternal life. We think about the eternal because we can live eternally. The perceived idea of eternal life includes the technology to achieve it. Regard your thought from an infinitely distant state and you will see yourself as if in a magnifying mirror. Create sharply a light beam in your perception and you will once again understand and believe that eternal life in one physical body is achievable. From the start point of this beam, approach your physical body infinitely close with your consciousness. You will see that eternity is inseparable from you. The task is to maintain and strengthen such structure of thought in any actions, and then since this point you will be provided with the technology of eternal life. The spirit that possesses the property of universality will create your creative capabilities that will enable you to master eternal life quickly. The soul will reveal the path to be able to live eternally in all circumstances. The inner harmony with yourself originates from the knowledge of what is happening in terms of the realization of eternal life. On a harmonious wave, combine the information about the eternal life of the body, mind, soul and spirit, and you will pass the light of the knowledge of eternal life to all. This will prove that you, by realizing eternal life, will have its eternal future, because you will find that such knowledge brightened by eternity will necessarily become universal, which means that at the same time this knowledge, advanced by the experiences of others, will become yours again. By getting the following systemic and new knowledge that ensures eternal life, you are helping to master eternal life even more people whose number becomes infinite. With such combined technology of eternal life and force, you can surely achieve eternal life for all people and all living in general. Grigori Grabovoi created the text of “The Teachings of Grigori Grabovoi about God. The Technology of Eternal Life.” on June 5, 2015. Вечно жить должны все. Соответственно, знания о том, как жить вечно, необходимо освоить каждому. Для этого всюду нужно внедрить технологию вечной жизни. Создатель вечный образует вечное. Любое образование должно включать в себя знания, обеспечивающие вечную жизнь. Мы мыслим о вечном потому, что способны вечно жить. Воспринятая мысль о вечной жизни включает в себя технологию её достижения. Рассмотрите свою мысль с бесконечно далёкого состояния, и Вы увидите себя как в увеличивающем зеркале. Резко создайте световой луч в своём восприятии, и Вы в очередной раз поймёте и уверуете, что вечная жизнь в одном физическом теле достижима. С точки начала этого луча приблизьтесь сознанием к своему физическому телу бесконечно близко. Вы рассмотрите, что вечность неотделима от Вас. Задача – сохранять и наращивать такую структуру мысли в любых действиях, тогда с этого момента Вы будете обеспечены технологией вечной жизни. Дух, обладающий свойством всеобщности, создаст Ваши творческие возможности, позволяющие быстрее освоить вечную жизнь. Душа покажет путь уметь жить вечно при любых обстоятельствах. Внутренняя гармония с собой возникает от знания того, что происходит с точки зрения реализации вечной жизни. Соедините на гармоничной волне информацию о вечной жизни тела, сознания, души и духа, и Вы передадите свет знаний вечной жизни всем. Это докажет, что Вы, реализовывая вечную жизнь, будете иметь её вечное будущее, так как увидите, что такие осветлённые вечностью знания обязательно станут всеобщими, а значит одновременно снова Вашими, расширенными опытом других. Получая следующие системные и новые знания, обеспечивающие вечную жизнь, Вы помогаете освоить вечную жизнь всё большему количеству людей, переходящему в бесконечную величину. Такой объединённой технологией вечной жизни силой наверняка можно достичь вечной жизни для всех людей и вообще всех живущих. Текст «Учение Григория Грабового о Боге. Технология вечной жизни» Григорий Грабовой создал 5 июня 2015 года. Eternal life often necessitates accelerated thinking because it is necessary to process a lot of information. When you work with information, it is possible, in these cases, to perceive the trace of information that differs from the information by more gray tones and a final volume. However, you can de-archive the trace of information, and, due to the areas opening in the process of de-archiving, increase the speed of thinking up to an infinite value. Then a thought and a wish can become a reality even before they occur. Therefore, in super-speeds, you have to be able to understand what kind of thought or wish might arise, and only if you are satisfied with them let them occur. The distinctiveness of the work with the spirit in the conditions of eternity is that you need to perceive simultaneously many spiritual states in one current state. The spirit meets itself. The Creator sees himself from the future being it. The soul in eternity is completely harmonious, because it is eternal. Tune in to cognition and the state of soul in eternity, and then the speed of your thinking can always reach the required value, which provides eternal life. Be aware of thinking as of an inexhaustible source of eternal life, and then nobody will be able to resist life, because all the objects of information have thought or what is similar to thought. Create live eternity by the fact that your thought could be beyond eternity. 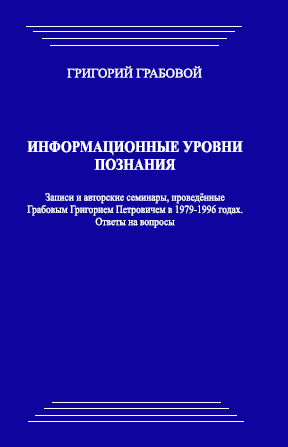 The text of “The Teachings of Grigori Grabovoi about God. The Method of Acceleration of Thinking in Eternity” was created by Grigori Grabovoi on June 4, 2015. Вечная жизнь обуславливает необходимость часто ускоренно мыслить в связи с тем, что нужно обработать много информации. При работе с информацией можно в этих случаях воспринимать след информации, отличающийся от информации тем, что он имеет больше серых тонов и конечный объем. Однако след информации можно разархивировать и за счёт раскрывающихся в процессе разархивации областей, увеличить скорость мышления вплоть до бесконечной величины. Тогда мысль и желание могут становиться реальностью ещё до их проявления. В сверхскоростях поэтому нужно уметь понимать, какая может возникнуть мысль или какое желание, и только если они устраивают Вас, нужно отпускать их на проявление. Своеобразность работы духом в условиях вечности заключается в том, что нужно одновременно воспринимать много духовных состояний в одном текущем. Дух встречается с самим собой. Создатель видит себя из будущего, являясь им. Душа в вечности абсолютно гармонична, ибо она вечна. Настройтесь на познание и состояние души в вечности, и тогда скорость Вашего мышления всегда может достигать необходимой величины, обеспечивающей вечную жизнь. Осознавайте мышление как неиссякаемый источник вечной жизни, тогда ей никто не сможет сопротивляться, так как мысль или то, что подобно мысли, есть у всех объектов информации. Оживотворяйте вечность тем, что Ваша мысль может быть и за вечностью. Текст “Учение Григория Грабового о Боге. Метод ускорения мышления в вечности” Григорий Грабовой создал 4 июня 2015 года. There is an unlimited variety of areas in eternity where events occur at the same time. Having perceived several light volumes of event, you can see that the events are connected with your body, heart work, with your soul. Try to feel the connection lines going from events to you. A dynamic information that contains the truth of each event emerges between the lines. The essence of all the events is in you. The creator cognizes the event simultaneously with their creation, and the thought about infinity, which originates from eternity that has already been created, is the criterion of eternity. Push off with your consciousness against the reality of eternity and you will understand that the truth, in every perceived event, is born in the spirit that covers them. The text of “The Teachings of Grigori Grabovoi about God. Striving for Truth with the Diversity of Eternity” was created by Grigori Grabovoi on June 2, 2015. В вечности неограниченное множество областей, в которых одновременно происходят события. Восприняв несколько световых объёмов событий, можно рассмотреть, что события связаны с Вашим телом, работой сердца, с Вашей душой. Постарайтесь ощутить линии связи, идущие от событий к Вам. Между линиями появляется динамичная информация, содержащая истину каждого события. Сущность же всех событий находится в Вас. Создатель познаёт события одновременно с их созданием, и критерием вечности для него является мысль о бесконечности, берущая начало от вечности, уже созданной. Оттолкнитесь своим сознанием от реальности вечности, и Вы поймёте, что истина в каждом воспринятом событии рождается в духе, который охватывает их. Текст “Учение Григория Грабового о Боге. Стремление к истине при многообразии вечности” создан Григорием Грабовым 2 июня 2015 года.